The film features an amazingly gifted dog named Buddy (Framm), nicknamed "Air Bud." His owner's name is Josh Framm, who initially backs up the star QB Cole Powers before Powers goes out with a dislocated shoulder. Tom is Josh's best friend, Goose is a random teammate with no hope on kick returns, and Juan is the kicker. Below are the hand calculated stats for the games shown in the film, computing the totals for the year. Some major caveats include the fact the movie showed only a handful of plays from each game, virtually no defensive plays, and featured only a couple of players. Regardless, it's a not-so-serious but fun look at this charming film. Amazingly, every ball Air Bud caught went for a touchdown. 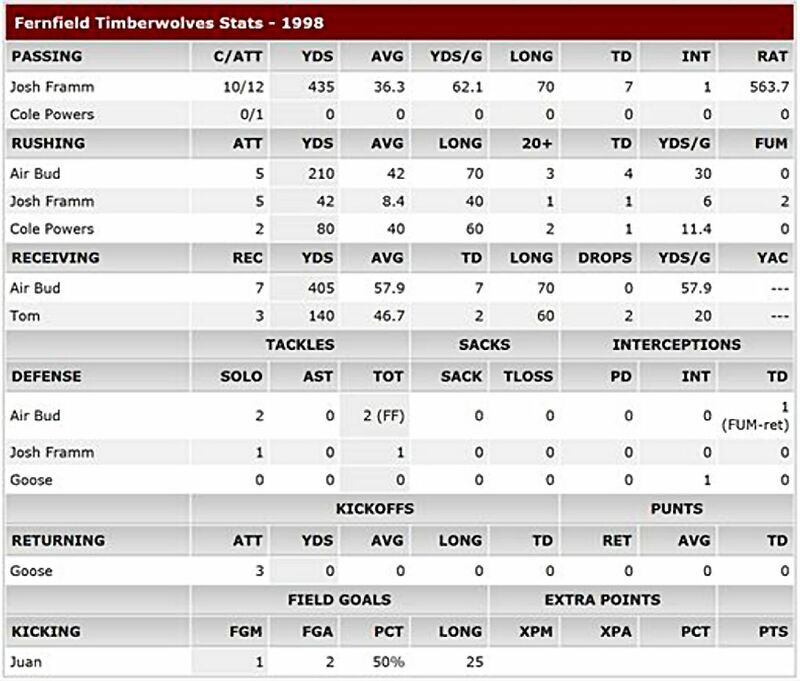 He also had 4 of his 5 rushes go for touchdowns, and he forced 2 fumbles on the season, returning one for a TD as well. He is only shown being tackled onscreen on one play during the entire movie (despite not even having the ball). He goes out of the game with an injury following that tackle.. Copyright (c) 2017 Alaska Works.